Surfing the Coldstream Festival is back again! What is “The Coldstream” you might ask? It is the street running through the middle of our very own Yamba. Saturday October 15 will see the street lined with music, colour and movement as the Surfing the Coldstream festival kicks off again for its 11th year. 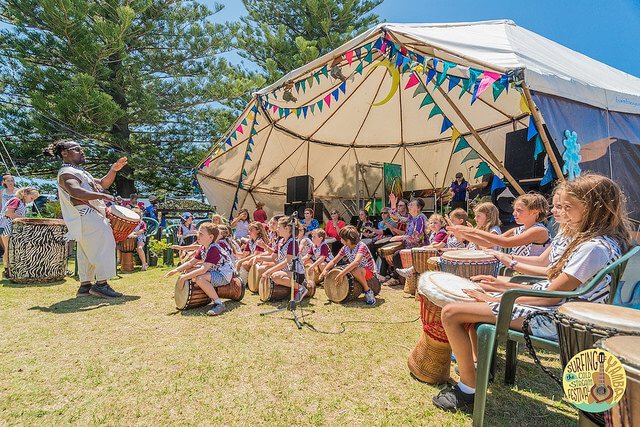 With a live music lineup of over 12 artists, African drumming demonstrations, a rock performance showcasing the musical talent of 6 local primary schools, a film festival and a number of activities for the kids, Yamba will be the place to be in the Clarence Valley. What’s even better than a fantastic festival? A completely free festival! This will be a great day out for both you and the kids. If you’re planning on spending some time in Yamba later in the year, try and make it down in time so you don’t miss out!